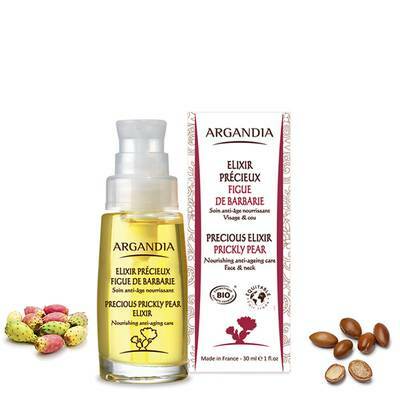 This elixir concentrates and enhances all the qualities of two rare and precious organic oils: Prickly pear and Argan. These oils are rich in essential fatty acids (Omega-6, Omega-9), vitamin E and delta 7 stigmasterol. Genuine antioxidant concentrate, it nourishes the epidermis intensely and strengthens the skin’s natural protection to fight against the effects of pollution, stress and age. Precious Elixir prickly pear oil is suitable for mature skin, it nourishes the epidermis intensely and strengthens skin’s natural protection to fight against the effects of pollution, stress and age. Anti-wrinkle and tensor, it fights effectively against the passing of time. Your skin will be revitalized, regenerated and protected. Apply morning and evening as an anti-aging treatment or intensive nourishing care. It leaves your skin with a soft and satiny veil.